Kids love the thought of being able to eat flowers and there are some great varieties that can be grown in any garden. 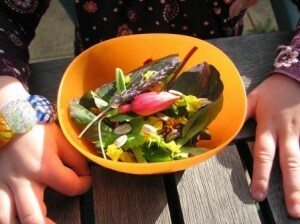 Edible flowers are a wonderful way to add colour to meals and can make a salad more appealing to kids. Many edible flowers are fantastic for attracting beneficial insects and repelling those that are not so welcome so growing them is not only great for your kid’s dinner plate but good for the garden too. Vegetable flowers from pumpkin, zucchini and pea plants. When eating flowers keep in mind the old saying ‘less is more’. Some flowers, such as lavender, have a very strong taste and it is often better to sprinkle a few individual flower petals through a salad or using a flower as a garnish rather than eating the whole flower. Make sure all flowers are well washed before eating them and never eat flowers from florists, nurseries or supermarkets as there is a good chance that they have been sprayed with chemicals. It is best to use flowers from your own garden where you have more chance of knowing what is on them. What edible flowers have you grown and/or eaten? This entry was posted in Flowers, Recipes and tagged flowers, fruit, gardening, kids, marigolds, recipes, sunflowers, zucchini.